Walking with light weights is appropriate for women of all ages. Many women avoid strength training for fear of developing large, manly muscles; however, this fear is scientifically unfounded. According to the American Council on Exercise, a combination of hormones, DNA and body type dictate your muscular capacity and it's unlikely that most women will build massive muscles. 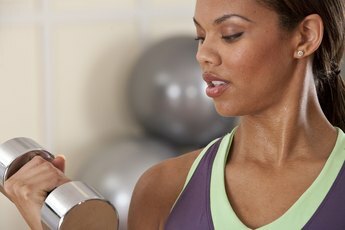 Once you let go of the fear of looking like a bodybuilder the next time you put on a bathing suit, it's time to grab a pair of light -- two to three pound -- dumbbells and add some more resistance to your exercise routine. 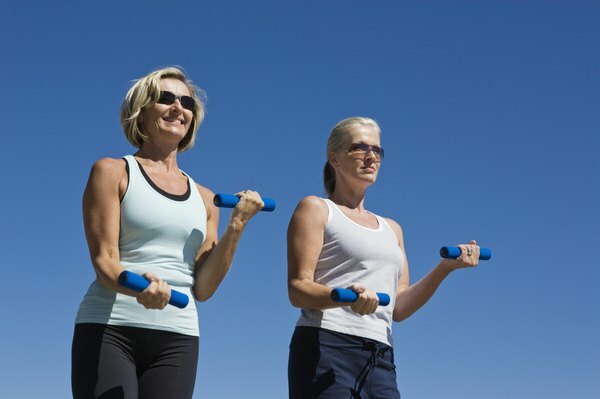 Strength training also builds healthy muscle mass and bone density, which is particularly important for women over the age of 20. Stand up tall with a straight spine and your feet together. Hold a dumbbell in each hand, palms facing outward. Tuck your elbows in to your sides. Keep your inner arms next to your sides during the entire exercise. Curl your right forearm and hand to meet your right shoulder. Lower your arm back down to your side. Repeat with the left arm. This completes one full repetition. Stand up tall with a straight spine and your feet together. Hold a dumbbell in each hand, palms facing each other. Position your hands down by your sides and keep your inner arms to the sides of your waist throughout the entire exercise. Step forward with your right foot until the knee and thigh make a 90-degree angle and the thigh is parallel to the floor. Bend your left knee until it almost touches the floor. Press your right foot into the floor and stand up, pulling your leg back to the starting position. Repeat the sequence on your left leg for one full rep. Stand up tall with your feet hip-width apart. Hold a dumbbell in each hand, palms facing each other. Position your arms by your sides. Bend your knees deeply and sit back until your knees create a 90-degree angle and the thighs are parallel with the floor. Do not slide your knees further than your toes. Press into the floor and stand up. 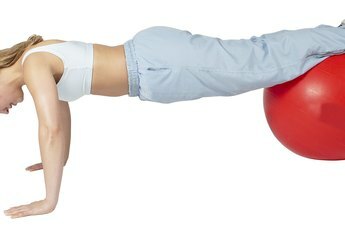 Raise your heels off the floor and press into the ground with the balls of your feet, engaging your calf muscles. Lower your heels to the floor to complete one full rep. Perform three sets of 12 to 15 repetitions. Perform strength training activities two times per week, leaving at least one to two days in between sessions for muscle recovery. If light dumbbells are too heavy to use, try using two cans of vegetables instead. Speak to your doctor before starting a new exercise routine.